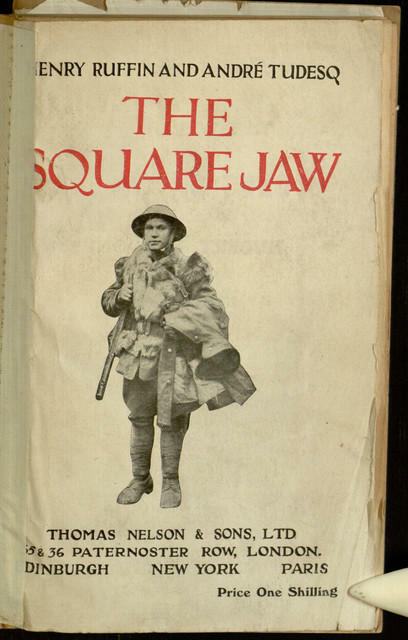 The most recent book released to Distributed Proofreaders is The Square Jaw by Henry Ruffin and André Tudesq, an English translation of a French-language book discussing episodes from World War I. Our copy is part of the library’s Irish American Collection donated by Joseph McGarrity. To help create a new electronic edition of this long out of print book, you can read this earlier post about how the proofreading process works, then join in at the project page. Hot on the heels of The Boy Aviators with the Air Raiders comes the release of another “Captain Wilbur Lawton” children’s adventure novel, The Ocean Wireless Boys on War Swept Seas. Like the Boy Aviators adventure that preceded this, War Swept Seas takes the heroes of an established line of books and faces them with the dangers of a brewing global conflict. With this type of series book, it is often difficult to identify authors, since most titles were published pseudonymously, and some pseudonyms were shared. There was no real Captain Wilbur Lawton. It is known that at least some of the Lawton titles were actually the work of journalist John Henry Goldfrap, but it is possible that other authors contributed as well. 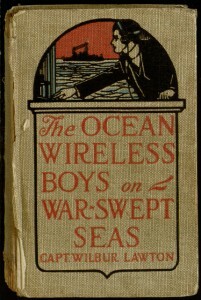 If both Air Raiders and War Swept Seas are truly the product of the same pen, it shows significant growth between the two books, as War Swept Seas is a significantly more readable and interesting tale than its predecessor (and, for that matter, the previous Ocean Wireless Boys adventure, The Ocean Wireless Boys on the Pacific). You won’t find a whole lot of complex plot here, but the author throws in such a steady stream of action that it’s hardly missed. A marked contrast to the more common message that war is hard but necessary, or even that war holds an unavoidable attraction to all boys. It would have been interesting to have seen if the message evolved in subsequent volumes after deeper U.S. involvement in the war, but sadly, Goldfrap died in 1917, and no further Captain Lawton adventures were published. The entire book can now be read online or downloaded in a variety of popular eBook formats through Project Gutenberg. Our third World War I-themed children’s novel (following The Liberty Girl and The Brighton Boys in the Trenches) is now available in eBook format thanks to our collaboration with the Distributed Proofreaders project. 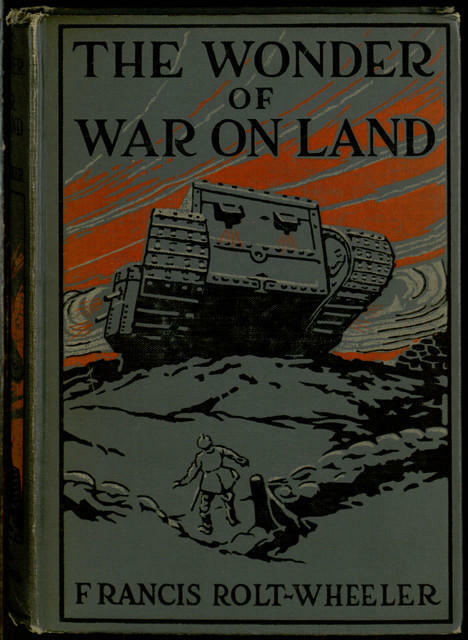 This book, Francis Rolt-Wheeler’s The Wonder of War on Land, is quite an unusual creation. It is a novel about a young American boy who witnesses German attacks on Belgium early in the war and becomes increasingly involved in the unfolding conflict. In spite of its fictional nature, it looks like a work of non-fiction, illustrated throughout with photographs (often unrelated to the text) and making fairly heavy use of footnotes (sometimes to cite sources of anecdotes shared by characters, sometimes to indicate places where events have been presented out of historical order). The actual text of the story is just as unusual as its formatting. 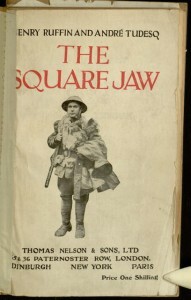 After an introduction proclaiming the author’s desire “[t]o give the boys of the United States a fair viewpoint on this war,” the reader is presented with the novel itself, a strange mix of lengthy didactic monologues, pro-French/anti-German propaganda, bizarre incidents, surprisingly unrestrained violence, and periodic hints of the supernatural. By the time our hero is fleeing Belgium in the company of a friendly hunchback and a caged eagle which he captured in hand-to-wing combat as a symbol of victory, it is clear that this is not quite the typical war novel. The book never quite seems to know what it wants to be — a textbook, an inspirational adventure novel, a document of the horrors of war — and so it never quite meshes into a satisfying whole. However, the fact that it is such an odd hodge-podge makes it an interesting study, and the unusual biography of the author may serve to shed some light on its eccentricities. If you wish to see the whole thing for yourself, the book can be read online or downloaded in various popular eBook formats through Project Gutenberg. 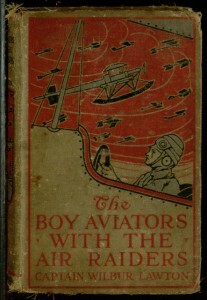 Like our previous Distributed Proofreaders project, The Boy Aviators with the Air Raiders, our latest title, The Ocean Wireless Boys on War Swept Seas, is a World War I adventure story aimed at young readers and written by Captain Wilbur Lawton (actually a pseudonym of journalist John Henry Goldfrap). While Air Raiders was released before U.S. involvement in the conflict, War Swept Seas came out in 1917, closer to the end of the war. This title also marks the final volume in the Ocean Wireless Boys series, immediately following The Ocean Wireless Boys in the Pacific, which was made available in eBook format as a result of one of our earlier projects. If you are interested in helping this concluding adventure join its predecessor in the electronic age, you can read this earlier post about how the process works, and then visit the project page to begin preparing pages for Project Gutenberg. The first World War entered American popular culture some time before America entered the war. This fact is evidenced by our latest title available as a Distributed Proofreaders project, The Boy Aviators with the Air Raiders. 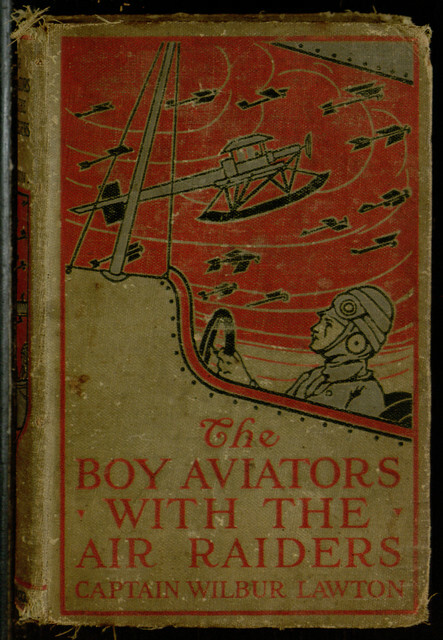 This book, part of an ongoing series of airplane-themed children’s adventure novels, plunges its youthful protagonists into the conflict as early as 1915. If you are interested in helping produce a new eBook edition of this vintage title, you can read more about our proofreading efforts in this earlier post, then dive into the project page here. A few months ago, we helped produce an eBook of The Brighton Boys in the Trenches, an interesting example of the fiction marketed to boys during the first World War. Our latest release, The Liberty Girl by Rena I. Halsey, complements this as a specimen of Great War fiction intended for reading by girls. 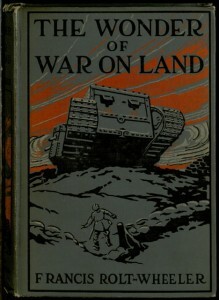 Released in 1919, it seems likely that this was written during the war under the assumption that the conflict would still be raging upon its publication. The book continues the narrative of Nathalie Page, a character introduced in the non-war-themed Blue Robin, the Girl Pioneer. Nathalie begins the book with mixed feelings about the war, and several other characters are also critical of the conflict — offering slightly more moral shading than one might expect here — but the story is clearly designed to convince the reader of the justice of the cause, and everyone finds significant patriotic fervor by the end of the tale. Obviously, a key distinction between Brighton Boys and Liberty Girl is that the boys were able to enlist and fight the battle directly, while Nathalie can only offer support from the home front. In spite of that limitation, the book is not solely about domestic activities; there are discussions of girls going overseas to support the troops, and some gruesome battlefield narratives are offered by way of a character returned from the front. 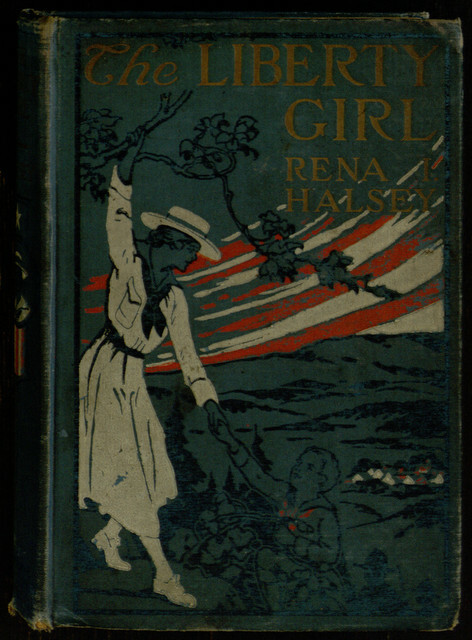 Of interest to dime novel readers is the fact that author Rena I. Halsey is the daughter Harlan P. Halsey, also known as “Old Sleuth,” a prolific dime novelist. The use of coincidence and disguise in the narrative here betrays at least traces of the Halsey family’s dime novel roots. If you wish to read the book for yourself, it can be found at Project Gutenberg, where you can view the text online or download it in a variety of popular electronic formats. Our latest proofreading project is Rena Halsey’s The Liberty Girl, a sequel to the earlier Blue Robin, the Girl Pioneer. This 1919 novel deals with, among other things, the Great War, making it an interesting feminine complement to the overtly masculine Brighton Boys in the Trenches. The project also ties in to our dime novel efforts, as Rena Halsey was the daughter of Harlan P. Halsey, better known as Old Sleuth, author of (among countless other titles), The Twin Ventriloquists. Truly, everything around here is connected in one way or another! The book is now available at the Distributed Proofreaders site. To help us create a new electronic edition, you can read more about our proofreading efforts and then visit the project page. As with the previous project, this one is likely to raise some eyebrows, but it should also provide another interesting look at the way war was portrayed in popular fiction during a very different era. If you are interested in helping produce a modern eBook edition of this vintage text, you can join in our proofreading by visiting the Wonder of War on Land project page, and you can learn more about the proofreading project from our earlier blog post on the subject.